It was exciting to wake up in the desert the first morning, and enjoy the views from our nice little cabin in the middle of nowhere. 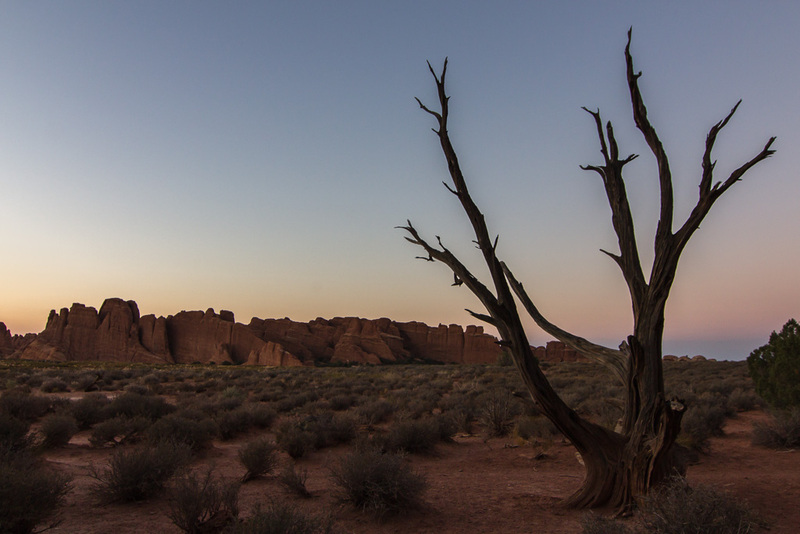 After a lazy morning, we drove to Arches National Park, a park with over 2000 natural sand stone arches. 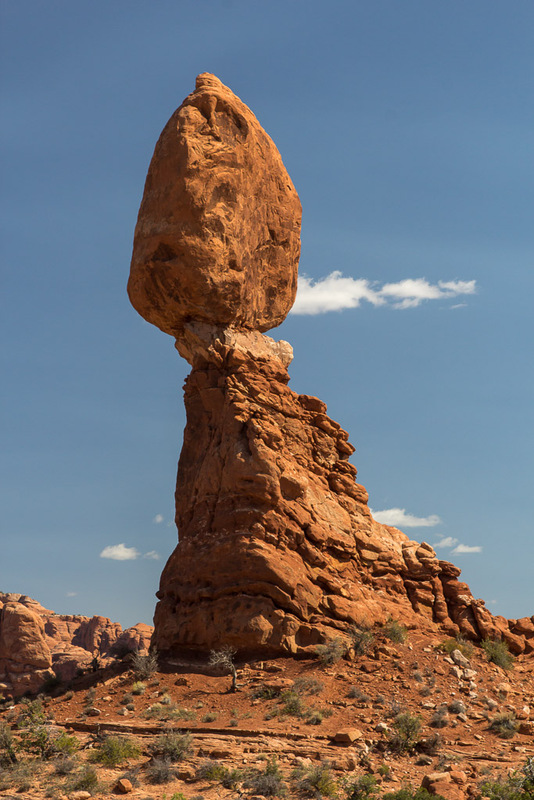 We bought a pass that allows entry to all national parks for a year, as we will be visiting many 🙂 Our first stop in the park was Balancing Rock. 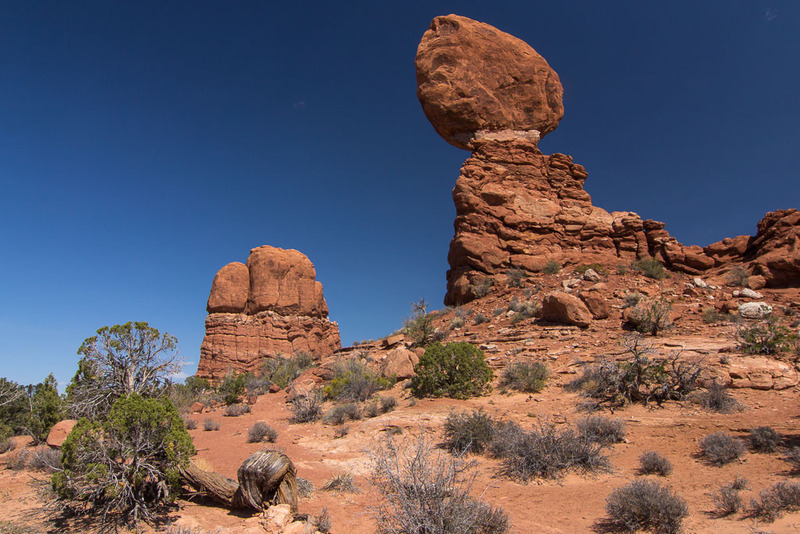 There is a short trail that goes all the way around the rock pillar, so you can admire it from all angles 😉 We were not used to the heat yet, and were taking it very easy. Until a tour bus full of pensioned people arrived and we decided it was time to leave! 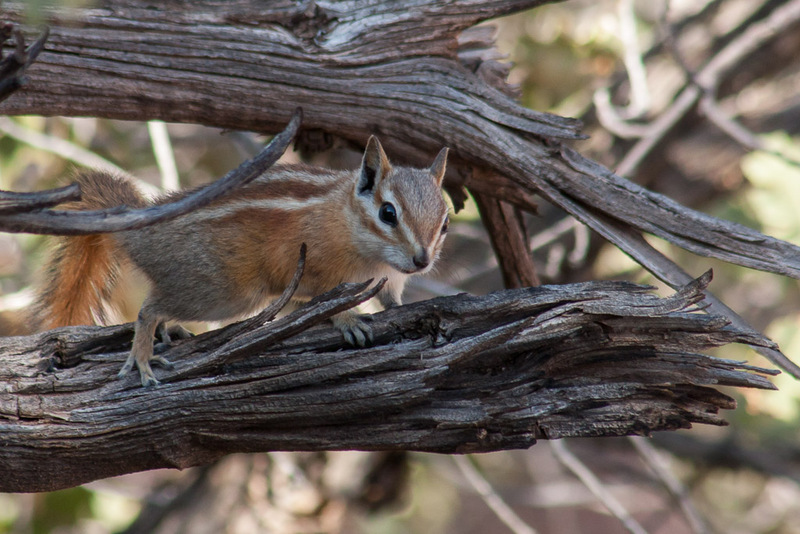 Ok, one more photo of the chipmunk because he’s so cute 😉 There are lots of them everywhere in the states, and after a while you get so used to them that you don’t take photos anymore. We continued our hike, wondering when we would get a glimpse of our final destination. In fact you don’t get to see it until the very end of the trail. You turn a corner, and suddenly it’s there! 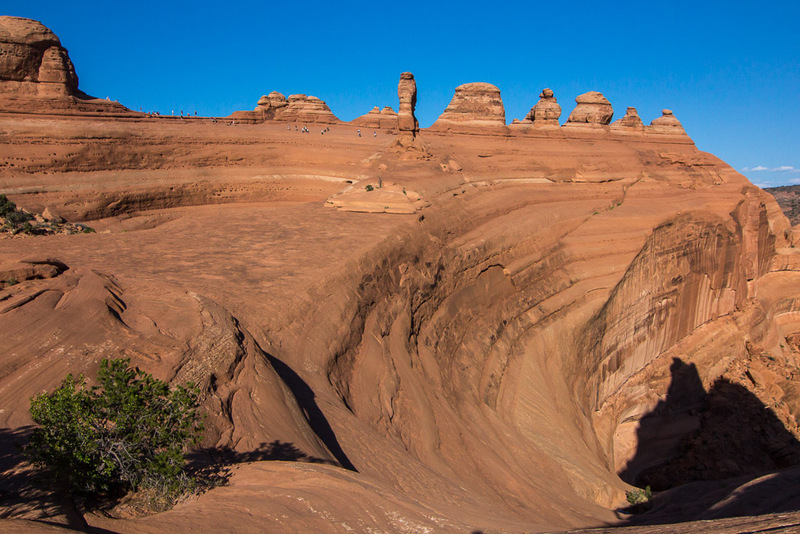 What a view… the arch is located right at the edge of a kind of platform of slickrock, so you have really nice views as well. 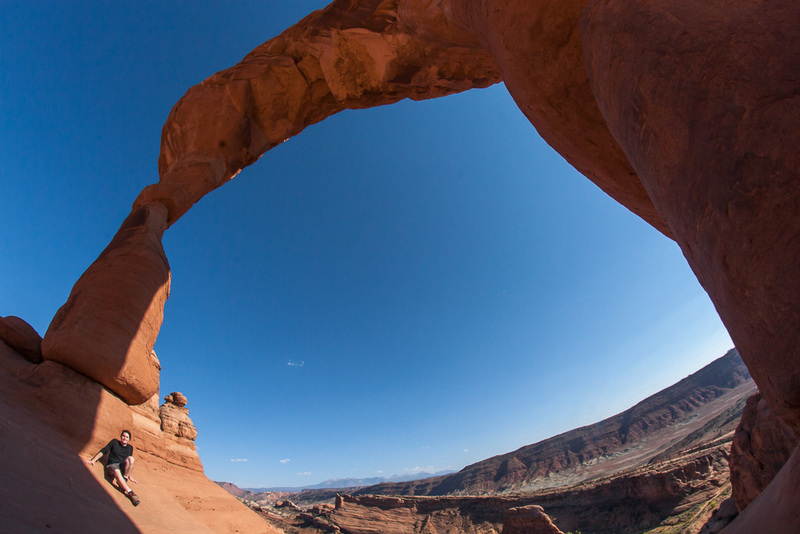 It was fun playing with the fisheye lens, which can fit the whole arch in even from close by. 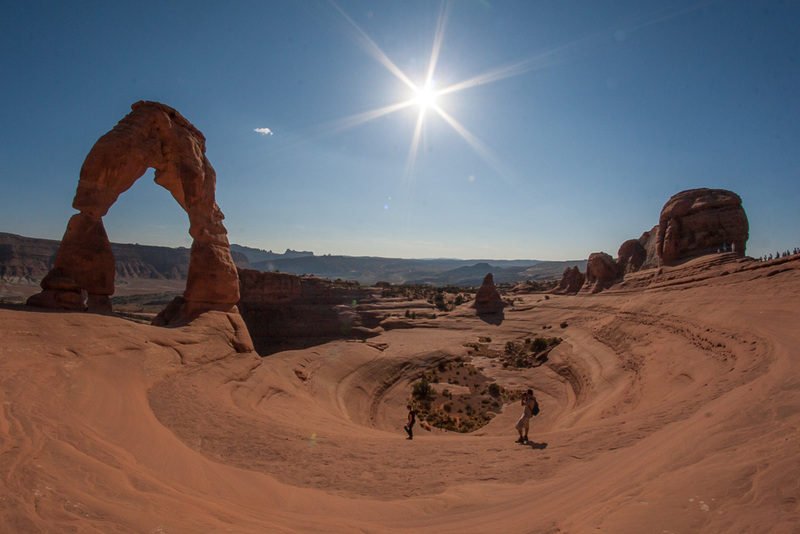 These photos show the surroundings of the arch a bit better, it’s like a big bowl! We actually walked to the bottom of the bowl, and climbed up on the other side. 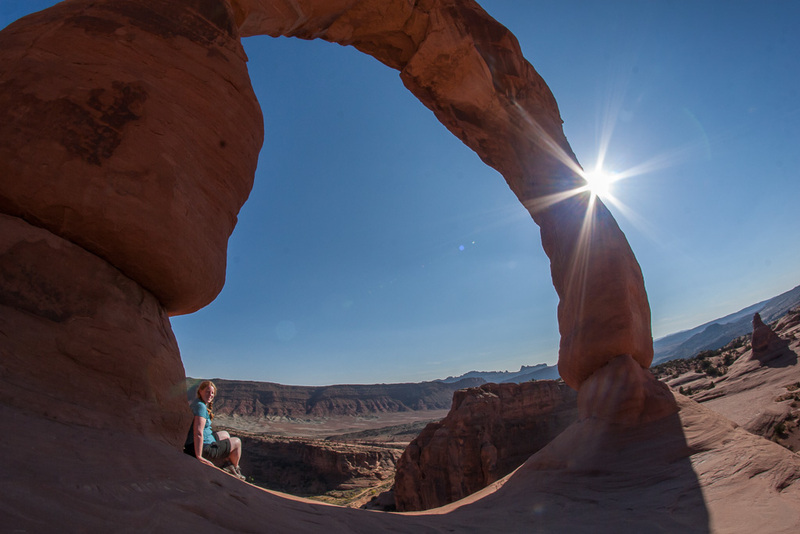 This is the unusual view from the other side, where you look right at the side of the arch so you can’t see the whole. 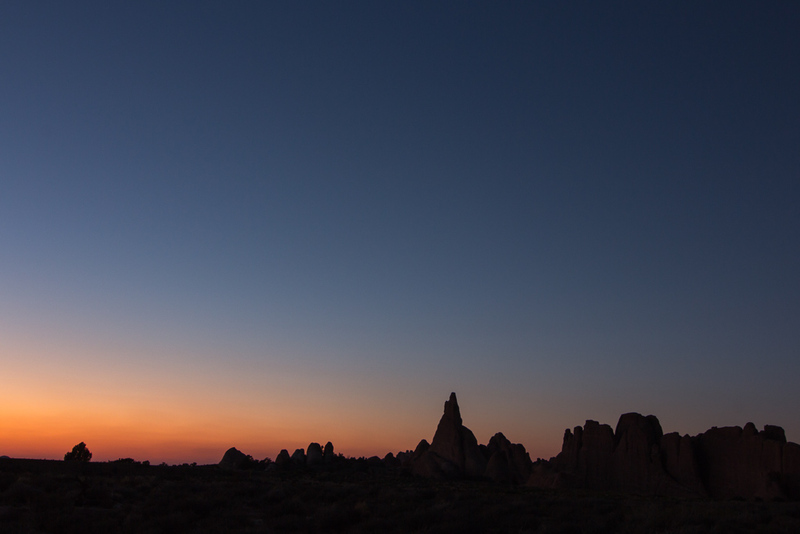 It becomes almost hard to spot 🙂 We walked back when sunset was on its way, and we saw LOTS of people walking up with tripods. 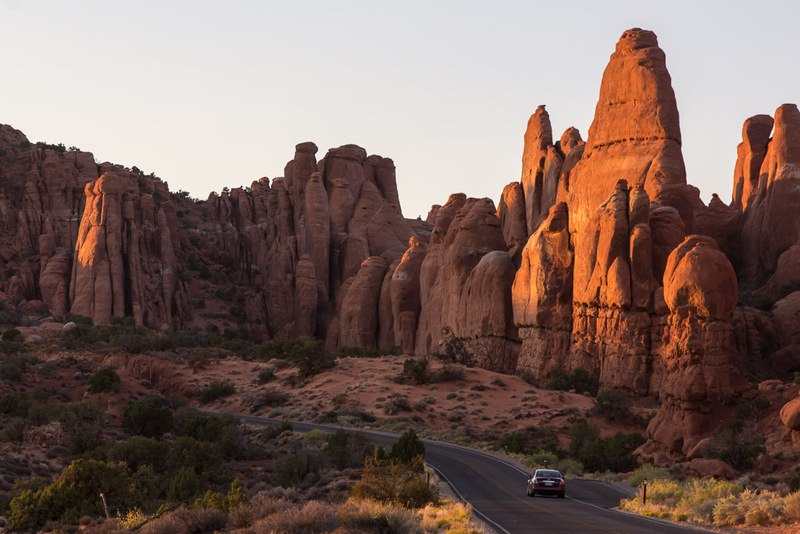 I wonder if they were all able to get a photo without 10 other photographers in it 😛 We drove a bit further into the park, and stopped at a viewpoint of Fiery Furnace. 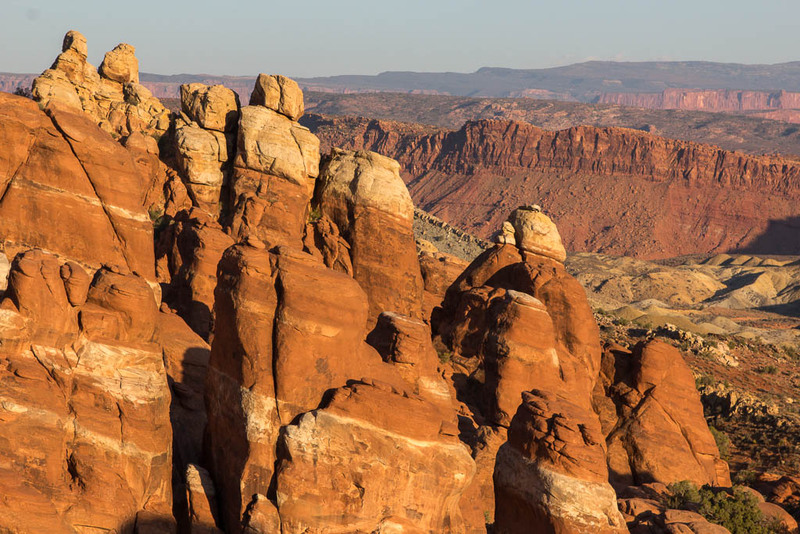 We would have liked to hike into Fiery Furnace, but you need to either join a guided walk (which needs to be booked quite a while in advance), or apply for a permit. Sunset was really beautiful… my favourite time of the day, when it finally cools down a bit and everything is turning a deep orange. 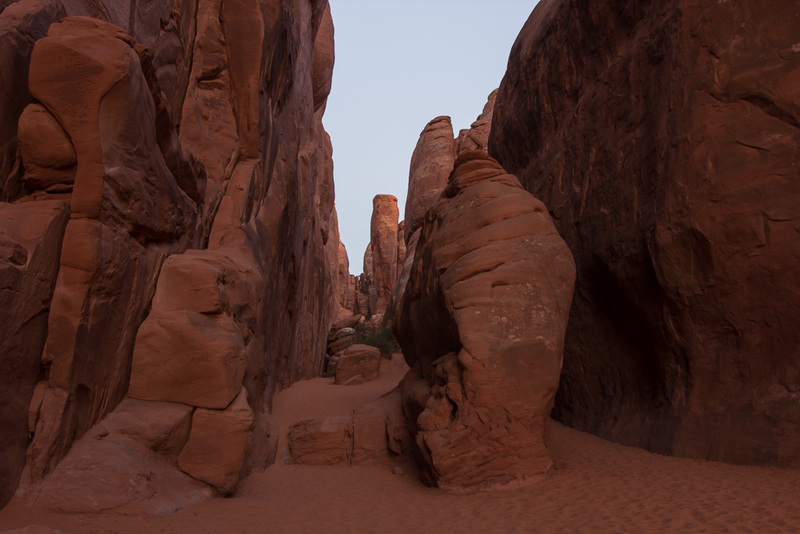 We walked the short trail to Sand Dune Arch, which is located inside a slot canyon. The floor of the canyon consists of amazingly fine sand! Unfortunately, at this low latitude sunset goes realllly fast, and it’s basically dark only half an hour after the sun has set. So after enjoying sunset, it was soon time to head back to our cabin. 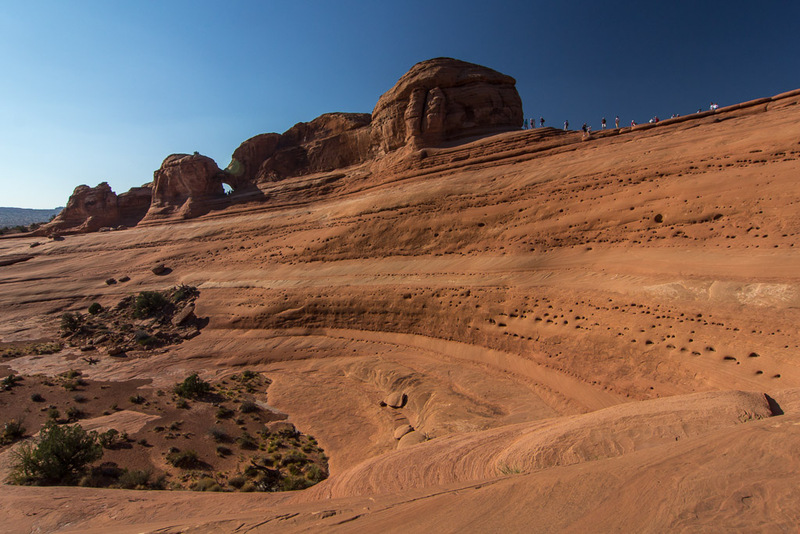 One of my all time favorite parks … and the view of Delicate Arch and the breathtaking scenery is worth every effort. It’s been 20+ years since I last visited … time to go back. 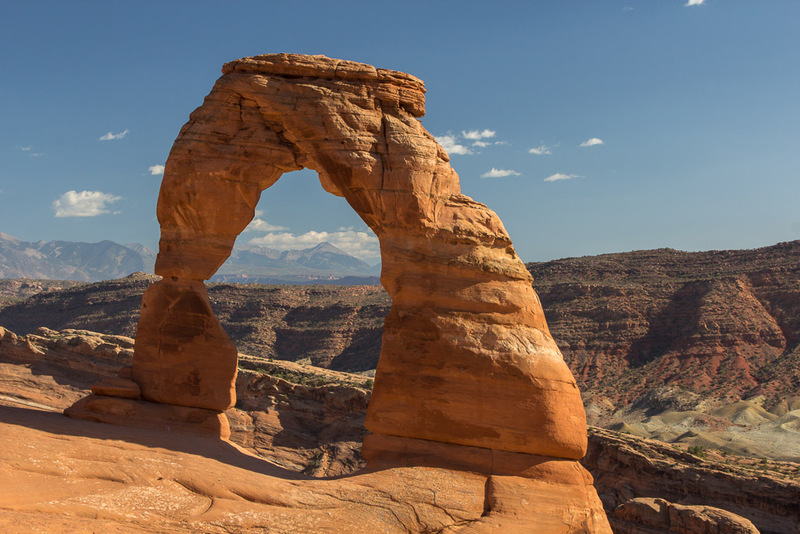 Love the way you captured the profile of Delicate Arch. The photo composition makes it look as if it is part of a group of Sphinx like strutures at the wide esplanade in front of a carved rock portico of an ancient temple. Ah! The pics you guys took of each other in the arch are quite creative. Did you plan them or you just took hurried turns before the crowd caught up with you? (Applause) Now I am sitting pretty for the rest of the show. Keep it coming. Jeetje Hanneke wat een geweldige trip! Wat is het daar ongelooflijk mooi en wat maak je toch altijd een prachtige foto’s. Cariëre switch? full time natuur fotograaf? Volgens mij zou je dat super doen! Ik heb van de week heel veel foto’s op je blog gekeken met mijn klas, want we hadden het over noordelijk europa, en dus moesten ze leren over midzomernachten, klimaat verschillen en noorderlicht. We konden alles op je blog vinden. Ja we hebben een fantastische vakantie gehad in Amerika, dit was pas de eerste dag van vele mooie dagen… 😉 Wat leuk dat je mijn blog hebt kunnen gebruiken met je klas!! En dankjewel… die carriere switch zou ik best willen maken, maar dat is een onzeker bestaan en durf het nu nog niet aan 😉 misschien ooit wel??? ik hoef niet te vragen hoe het met je gaat, want dat kan ik wel zien :-). Ziet er echt heel gaaf uit! Na NYC als eerste kennismaking met Amerika, staat dit gedeelte bovenaan de to-do list. Ondanks dat je pas 2 delen online hebt, ga ik deze route zeker onthouden. Ik kijk uit naar de volgende delen (wordt wel weer eens tijd voor part 3…, tenzij het Vegas wordt ;-))!